Toronto-based artist Christof Migone revisited Ray Bradbury’s classic tale of sci-fi colonization, The Martian Chronicles, and came away with cascades of sound. His work, The Rise and Fall of the Sounds and Silences of Mars (2010) consists of a page-by-page excavation of all sonic terms that appear in Bradbury’s original text. These terms appear as columns of words, all actively dislocated from their original context. For example, early on in the original novel, we read: “a voice sang, a soft ancient voice, which told tales of when the sea was red steam””“ but in Migone’s version all we get: “voice sang voice.”This work has appeared in various formats; in 2011 it was published as a book by Parasitic Ventures, and mounted as an outdoor installation at the Electric Eclectics festival in Meaford, Ontario. There’s also a freely downloadable PDF. Migone has a long history in sound-related art. His work playfully skirts the lines between exhibition, music, and sound poetry. With Brandon LaBelle he co-edited the anthology Writing Aloud: The Sonics of Language (Errant Bodies, 2001). He performed as part of the 2012 Whitney Biennial, he is a lecturer in the Department of Visual Studies at the University of Toronto, Mississauga, and is Director/Curator of the Blackwood Gallery. In the realm of the artist’s book, Migone’s “Mars”suggests itself as a Spartan rendition of Tom Phillips’ Humument, in which fissures of text serve as canvases for visual images and micro-narratives, or, of Brian Dettmer’s objects that mix sculpture and collage. Despite the piece’s formal rigor, Migone’s “Mars”is also quite personal in that it depicts the text as it appears in Migone’s personal copy of the original Bradbury book. Because he elected to collate the sound-related terms on a page-by-page basis, the project is an elegy to the rigid paginations of physical books, something that is rapidly evaporating with the popular advent of the ebook. This concern for the book’s fragility is just one of the ways in which Migone’s “Mars”draws on themes from Bradbury’s best-known work, Fahrenheit 451, the author’s clairvoyant expression of anxiety about a screen-obsessed culture. In a lengthy conversation, Migone discussed his broader sound practice, about the decision-making that led to the “Mars”project, and about the promise inherent in sound art that is itself devoid of actual sound. This conversation occurred on the phone in spring 2012, shortly before Bradbury passed away at age 91, and it is presented here, in a lightly edited version of the original transcript. Marc Weidenbaum: How did this specific book, The Martian Chronicles by Ray Bradbury, become the focus for your piece? Christof Migone: I was curating a show in Montreal and one of the artists — he makes little robots — referenced The Martian Chronicles in his artist statement. It seemed that it was my due diligence as a curator to research his inspiration and, also, I guess I happened to have the time, and it rekindled something I hadn’t really explored since high school: my interest for science fiction. I am not a huge connoisseur of the genre, but I was definitely a fan at the time, and I had not really kept up with it, except for J.G. Ballard, and I hadn’t read all the classics, and that is definitely a classic. Weidenbaum: At what point while reading it did the density of the sonic references occur to you? Migone: It was at some stage through that initial (research) reading. I’m not sure at what exact page or chapter, but I started circling. Well, first I started underlining, which is what I usually do, you know, bits of interest, and moments where sound or sounds were referenced. And that wasn’t even for that particular curatorial purpose, but since my field is primarily sound, the evocation and linking of this Martian landscape to these inhabitants and the way they are communicating, and Bradbury’s embodiment of that through sound piqued my interest. And the more I noticed, the more my underlines became circles, and so I circled those parts, which I usually never do in books, and even just in the act of circling, it made me realize that it might not be fulfilling my own interest for a nebulous future purpose, but it was becoming a piece. It didn’t quite have a form, but I knew fairly quickly that I was going to do something with it. Weidenbaum: Not long ago, I happened to re-read The Martian Chronicles, for the first time since high school, I think, and I had forgotten how much the book is a premonition of Fahrenheit 451. That book ends with an intrinsically sonic depiction of cultural memory: the idea of people keeping texts alive by memorizing them, so they’ll continue to be available even after the printed versions are burned. To what extent were you investigating the manner in which Bradbury explores sound as a means of sustaining a culture? Migone: It was purely on the surface, meaning, I wasn’t thinking of the intent of the author, or the repercussions of the text, but thinking just within the internal logic of the fiction; how characters are being characterized and animated within the narrative, and the author’s awareness of the aural. That was basically what I was paying attention to. Weidenbaum: How did the outdoor installation of Rise and Fall come to be? Migone: Gordon Monahan, a composer and sound artist, who lived for many years in Berlin, and now lives on a farm, north of Toronto. There he runs an annual arts festival called Electric Eclectics. 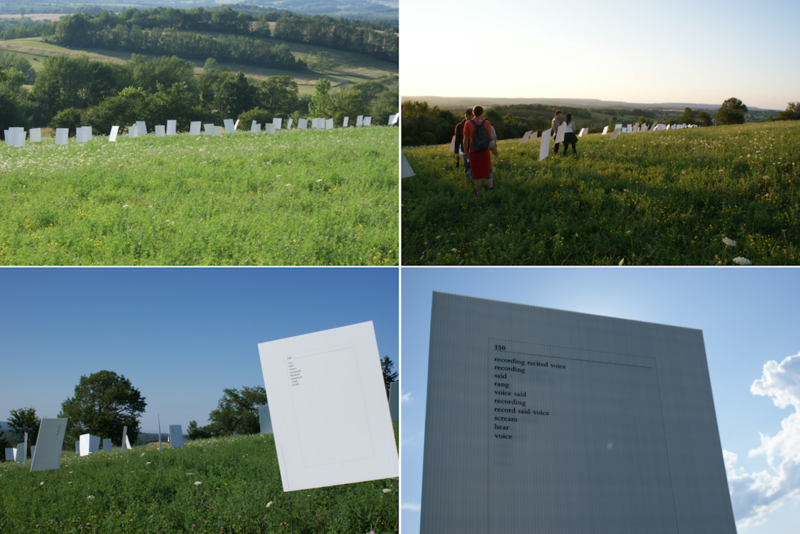 I was invited by him to create an installation at the 2011 edition of the festival, and it coincided with the book version of this project coming out. I had been to this festival a couple times, the year before to play live, and the year before that to accompany my partner, who was doing an installation. So, I had a good sense of the place and the nature of the festival ”“ the kind of acts that would appear and the tone of the event ”“ and I knew that I wanted to do something with text, with signage. You have to drive up a dirt road, and you’re going fairly deep into the country to end up at this place called the Funny Farm. That is an apt description of this farm; it is a surrealist place. It isn’t a working farm. It’s a place where two artists live, and given the space that they have at their disposal, they really concoct these magical spaces ”“ both indoors and outdoors ”“ and they’ve converted several small silos into spaces where people can do installations. My initial idea was to do a piece that would be something that the visitor to the event would come across on their way into the farm, up the dirt road. I wanted to have some kind of evocation of sound in the text in some way. Once I narrowed it down to this book, I thought that rather than have an excerpt, I wanted the whole piece to be present, and so the dirt road didn’t lend itself to that. So I switched my idea to this field, which is just below the stage where people perform. You don’t really see it in the images documenting the piece on my website, and there’s a whole other half of the field that you also don’t see, where people who are attending the festival are camping. It turned out to be a good decision because as you can see from the images, the landscape, even though it is very much of Earth, I think paradoxically, evokes the barren landscapes of Mars, mostly because they are dehumanized: it’s just grass and it seems to be endless. That’s a hyperbolic expansion of what’s actually there, of course. Part of the way I arranged them in the field was in a line, so once you’re in amongst the signs, you can look at either end of them and you have this idea that you are in a book; the panels are all in order, so you are walking from page 1 to page 182. Weidenbaum: Your banners in the outdoor installation bring to mind the idea of planting a flag, which is something we associate with colonization, inter-terrestrial and otherwise. Migone: Right, right. Yeah, they obviously aren’t staking ownership or territory, but at a formal level, there is that kind of placing a mark. I have always really enjoyed text pieces that are in situ; that you encounter in the city, be it Lawrence Weiner, or any artist who works primarily with text. Sometimes they allude to the history of the place, or spatial aspects of the place, but having that presence of language in the space ”“ as opposed to a sculptural intervention or in an architectural way, or with color ”“ the use of language brings a kind of poetics to it, which also makes me think of traffic signs or signs that are more utilitarian. In short, I find the presence of the literary in an open space a nice contrast to how one usually engages with the literary, for instance, at home on a bedside table. Weidenbaum: Can you talk about the title of the piece? Migone: One of my initial ideas as I was circling these words was to reproduce their placement on the page ”“ in a temporal way ”“ be it a video or a computer animation, so that you would see the worlds related to sound and sounds move in different places. I tried a few versions of that but it seemed to stick too closely to the text, and it seemed a bit labored for what I wanted to do. Whenever things get a little bit too complex at a technical level, I try to resist that. I prefer works that are kept simple: economical and elegant. So even though I tried a complicated process, I stopped. But in the process of doing that I had already come up with the title, The Rise and Fall of the Sounds and Silences from Mars, which is riffing off of the David Bowie album [The Rise and Fall of Ziggy Stardust and the Spiders from Mars]. I like that connection between the title of that album and the connection to The Martian Chronicles. The [sense of a] rise and fall [within the work] became a little bit looser, but the way I arranged the words ”“ because they’re arranged in columns ”“ you get this movement. There’s more distance now from this idea of movement, but the idea is there. Weidenbaum: There is something elegiac to the book, and the title reflects that. Migone: Right, I see the connection to a deeper interpretation of it, but I like the literalness of the title. Weidenbaum: On the two-page spreads in the printed version ”“ the physical book ”“ the words are justified right and left, which create an intense separation. What was your decision-making, typographically? Migone: I hadn’t thought of that mostly because Michael Maranda of Parasitic Ventures Press in Toronto did the typesetting. He came up with the cover, and he came up with the idea of the frame within the page. The frame is sized exactly to my own paperback copy of The Martian Chronicles, and he also did some research with the font and tried to approximate the font that appears in my book. I think it’s a Bantam edition, and the left and right was his decision. Obviously I approved it, but we didn’t have a discussion about that decision. I can see the symmetry of it, especially in relation to the page numbers, but that’s as far as it goes. Weidenbaum: You’d made a decision not to reproduce the placement of the words on the page. How did you decide on the direction you did take? Migone: I wanted to make it systematic. This was a thought — that I could acknowledge the amount of lines, but just keep them in a column and not think of their left and right movement — but I was in a mode of thinking that, well, if I’m not going to reproduce their placement on the page, I can abstract it even further. However, I did keep their appearance in a column, so that, let’s see, on page 140, the word “said”appears first and that means it’s the first appearance of a word dealing with sound or sounds on that page. The next word is ”˜voice’ on the same line in the original text, and that means they both appear on the same line in my text. Those were the basic structural devices, so that I had a system from the outset and I just applied it. I could have had a different system for every page, or every chapter, I guess. And I wanted to have some variety; the fact that one line could have more than one word if it appeared on the same line in the original book provides that variation, but aside from that, the column was the structuring rule. Weidenbaum: Was there a page with no sound-related word on it? Migone: Yeah, oddly enough, the very first page. I kept going back to the first page — “Can I find a word in there?”— because I was concerned some people would think it was a mistake or something. It was uncanny that it was the first page. Weidenbaum: There are two questions I want to ask at this juncture. The first is: When did you decide to include the word ”˜said’, which seems like it would significantly increase the ratio of words? Migone: It came late. Basically, there was a second round of going back into the book and looking at what I had culled from it and making sure I hadn’t made any mistakes. While the word ”˜said’ clearly denotes dialogue, I initially feared that it would overwhelm my project; be too present. But I came to the decision of including ”˜said’ during the second stage because it became obvious that it would have otherwise been a glaring omission. I had several categories in terms of selection. It could be words in a scene where sound is very clearly being engaged by the author, or words that could allude to sound but weren’t necessarily intended that way in that particular place in that book. 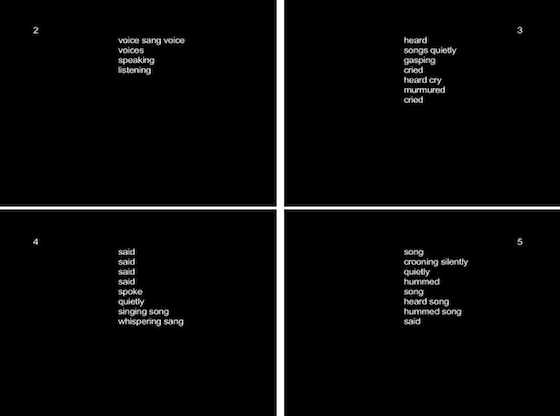 I also wanted to up the number of words selected, and since I was already abstracting the words into a different arrangement, it seemed fitting to the project to include any words that in and of themselves had sound properties. But obviously I didn’t add any words. Weidenbaum: And that would have been the second question: Do you include words that suggest sound but that don’t specifically mean it? Like, if someone says: “I can hear the sounds”that includes two words – ”˜hear’ and ”˜sounds’ ”“ and mean sound. But if someone says: “it sounds like you’re headed north not south”, that’s different. Migone: Yes, in that second case, I would include that. I like the fact that obviously those words had more than one usage. Weidenbaum: I think the reason it’s right for this project is because you’re taking words that have a formal and rhetorical purpose, and you’re abstracting them. So if the words already have a layer of abstraction, serving as the metaphorical rather than the literal, then those words should be included because they’re primed for the exact act that you’re encouraging. Weidenbaum: One thing that drew me to this work was that it is sound art that doesn’t include sound. We might call what you’ve done? “Sound art for the deaf”? Migone: Yeah, conceptual sound, or sound art, which has a mode that is more referential to sound, rather than actual sound. As an artist who started through radio, and then transitioned to audio publications — CDs primarily, in the early 1990s — it took me quite awhile to exhibit in a space. In that transition, I was very uncomfortable with the presence of sound in a gallery, for the known factors that: galleries are reverberant spaces; in a group show, you are sometimes intruding, so you’re forced to exhibit your work on headphones; the presence of bare speakers seemed to be overdone very quickly. It seemed, at least to me, that the strategy was to not take that route, but to think of ways where the presence of sound could be quite loud ”“ quite prominent ”“ but not in an audible way. That’s a challenge that I think is still ongoing for me, and obviously, I am not the only one mining this territory. I have always enjoyed that thwarting of a sense, but still providing sensorial input to that sense, via a conceptual or intellectual route. Weidenbaum: Another piece of yours that is sound art, yet has no sonic portion, is As Palestine as Possible, which you’ve described as a combination of work by composers Charlemagne Palestine and John Cage, along with “street protests concerning Palestine.”How did that piece come about? Migone: As Palestine as Possible is a very quick piece that has never been realized beyond the extent of a page on my website. But I am glad you pointed it out because it is almost as purely conceptual a piece as you could get in that it’s a title that alludes to a sound piece that doesn’t exist. It only exists as a title. Weidenbaum: When you proposed the “Mars”installation for Electric Eclectic, was there any pushback? Was anyone disappointed there wasn’t any actual sound? Migone: Oh, no, not at all. Gordon Monahan, and his partner Laura Kikauka, are very open. It’s a very casual, very loose context, so it was just about choosing the location, and then after that, it was carte blanche. I could do whatever I wanted. Weidenbaum: Was copyright violation a concern for you at all? Migone: Not at all. If anything, this is an homage to the book and brings attention to the book. To say there would be a copyright issue is like suggesting the word ”˜said’ is copyrighted, and it seems ludicrous to go that route. Weidenbaum: The book exists as a physical object, and there’s the installation you did, and then there is also the PDF, which seems like an increasingly valuable tool for sound poets. What do you think of the PDF as a form unto itself? Migone: I haven’t seen that many instances of that. They seem to be mostly electronic versions of what would exist in print. I have seen some in which the electronic form has been used to its fullest extent in terms of some interactive aspects. I think the more exploration of any medium that is used, the better. I wouldn’t value one over the other. I think it is natural that whenever a new platform is introduced, there is a kind of relishing of the new possibilities it introduces. That initial stage is often overwrought before the work settles and becomes more transparent. Weidenbaum: There’s a muscle memory to the process of looking for these words. When you were done with that part of the process, how hard was it to stop finding words in everything you read? Migone: It keeps happening: whenever I am reading something, what I am currently writing or curating, or working on as an artist will skew my reading. I only seem to find the things I am currently thinking about, which obviously is what I am bringing into the act of reading. Sometimes I have had the opportunity to go back to a text I have read and annotated, and I see I have missed other stuff. As I go back to that text for another reason, I am finding another thread in the text, which is great. In some cases it’s frustrating, because it means I missed certain things, but I think it is normal that you will have your reading filtered by whatever is preoccupying you at the time. Weidenbaum: This was a time-consuming process, I imagine, finding all the references in the text. How did you know you were done? How did you decide when you were done culling this text? Migone: Well, there was that second stage, where I added the word ”˜said’, and it was another opportunity for me to go back through it. I had my studio assistant assist me for some of it, for the sake of time, but whenever she does some work, I always check it to make sure everything has been done properly. I felt that I have been as accurate as possible. I’ve done other projects much more involved than this, much more prone to mistakes, where I get very anxious that someone checks that, say on page 57, I might have missed a word. Actually, I think that’s fine. I might have missed a word, but it doesn’t ruin the work in my view. I would be happy to hear from someone who tells me that I’ve made that type of mistake, in case there’s ever an opportunity to revise the work and make the correction. Plus, just the knowledge that someone spent enough time to check on my work is rewarding. I think the mistake of anyone would be to dismiss the work because of a mistake. That would be silly. Getting back to your question, I am a sort of (sort of a”¦) perfectionist, but I am also interested in failure as a concept; as a concept that one lives with and accepts. The following bio of the subject of the interview ran at the bottom of the article as it appeared at nomorepotlucks.org: Christof Migone is an artist, curator and writer. His work and research delves into language, voice, bodies, performance, intimacy, complicity, endurance. He co-edited the book and CD Writing Aloud: The Sonics of Language (Los Angeles: Errant Bodies Press, 2001) and his writings have been published in Aural Cultures, S:ON, Experimental Sound & Radio, Musicworks, Radio Rethink, Semiotext(e), Angelaki, Esse, Inter, Performance Research, etc. He obtained an MFA from NSCAD in 1996 and a PhD from the Department of Performance Studies at the Tisch School of the Arts of New York University in 2007. He has released seven solo audio cds on various labels (Avatar, ND, Alien 8, Locust, Oral). He has curated a number of events: Touch that Dial (1990), Radio Contortions (1991), Rappel (1994), Double Site (1998), stuttermouthface (2002), Disquiet (2005), START (2007), STOP. (2008), and Should I Stay or Should I Go (Nuit Blanche 2010 ”“ Zone C), and eleven others for the Blackwood Gallery. He has performed at Beyond Music Sound Festival (Los Angeles), kaaistudios (Brussels), Resonance FM (London), Nouvelles ScÃ¨nes (Dijon), On the Air (Innsbruck), Ménagerie de Verre (Paris), Experimental Intermedia (NYC), Méduse (Québec), Images Festival (Toronto), Send+Receive (Winnipeg), Kill Your Timid Notion (Dundee), Victoriaville Festival, Oboro, Casa del Popolo, ThéÃ¢tre La Chapelle, etc. His installations have been exhibited at the Banff Center, Rotterdam Film Festival, Gallery 101, Art Lab, eyelevelgallery, Forest City Gallery, Studio 5 Beekman, Mercer Union, CCS Bard, Optica. He has collaborated with Lynda Gaudreau, Martin Tétreault, Tammy Forsythe, Alexandre St-Onge, Michel F. CÃ´té, Gregory Whitehead, Set Fire To Flames, and Fly Pan Am. A monograph on his work, Christof Migone ”“ Sound Voice Perform, was published in 2005. In 2006, the Galerie de l’UQAM in Montreal presented a mid-career survey of his work accompanied by a catalog and a DVD entitled Christof Migone ”“ Trou. He currently lives in Toronto and is a Lecturer in the Department of Visual Studies at the University of Toronto Mississauga and the Director/Curator of the Blackwood Gallery. More on the artist at christofmigone.com. I think this may pertain. I love the Martian Chronicles and for a school project for my Sound Design degree my partner and I did an audio book of the chapter, Ylla. It was quite a fun project. Definitely pertinent. Thanks for having posted the audio link. Those little robots .. http://absolutevalueofnoise.ca/2006_preying/ The Martian Chronicles reference is down near the bottom of the page.